Do you get a bit antsy when you start to think about roasting a whole turkey. The mess, the weight, the stuffing, the carcass, the leftovers. Sometimes it seems to be overwhelming. 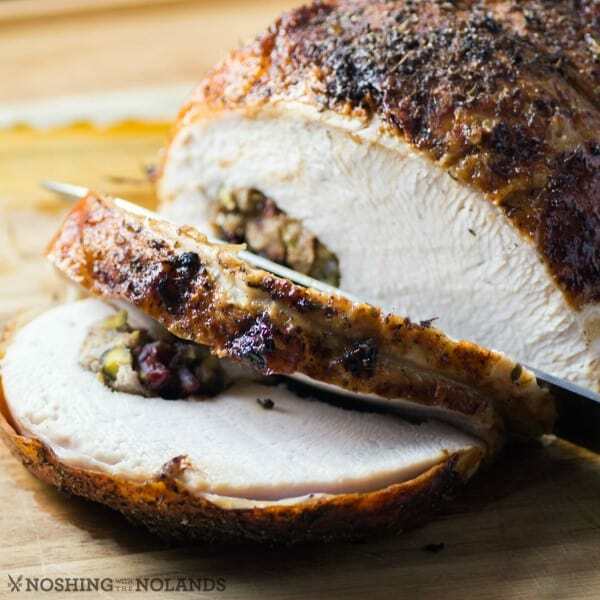 Don’t get me wrong I still do love to do a whole bird but if you try a Stuffed Roasted Turkey Breast you just might be amazed how much easier it is. I have done these for years when there is only the three of us for an occasion. They are simple and delicious. I don’t normally brine the turkey breasts but decided to do that extra step and they turned out so wonderfully seasoned and juicy. It is an easy step, you just need some forward thinking and planning. The end result is so worth it! No need to add salt to the outside as it is seasoned all the way through. The skin gets a lovely massage with olive oil and poultry seasoning. Sometimes I use herbs de provence also. Doing a Stuffed Roasted Turkey Breast like this is more like a roast. No bones to deal with, very little mess and fuss but the results will have you breathless with anticipation!! How do you check to see if it is done perfectly? 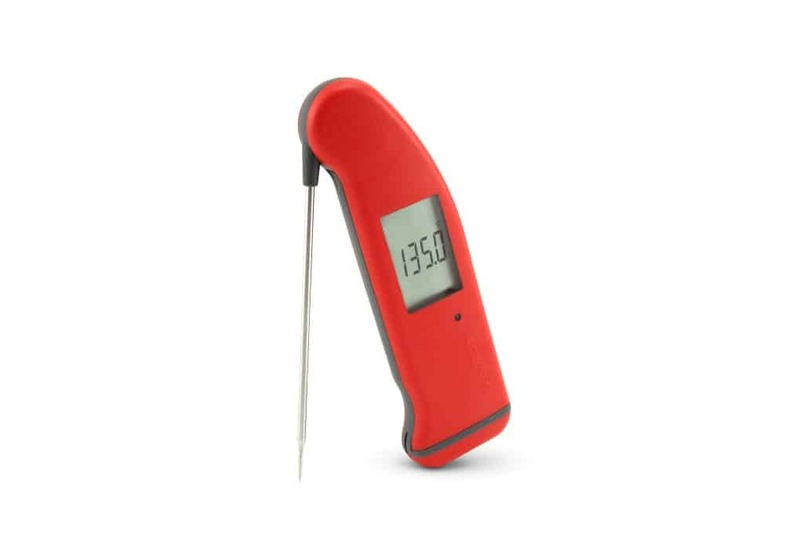 I use my easy read Thermapen, it gives you a very accurate instant temperature. 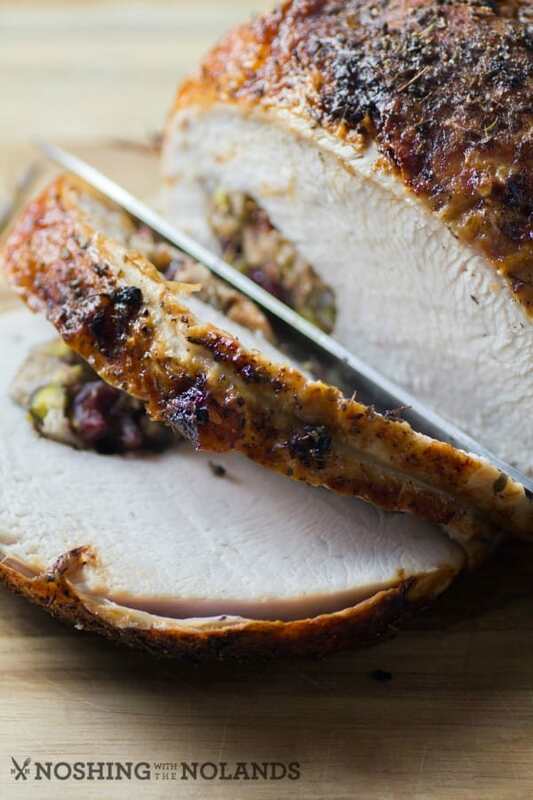 You don’t want to over cook your turkey but to a perfect 165F. The stuffing it so easy too. This one I developed years ago with what I had hanging around in the pantry. I always seem to have leftover dried cranberries and a nut of some kind waiting for me to do something with. In this case I used gorgeous pistachios to make it festive with the cranberries. This turkey breast can be the center of attention just like any whole roasted bird but with so much less stress. Your family and friends will be very impressed with something just slightly different for you to serve them this holiday season. 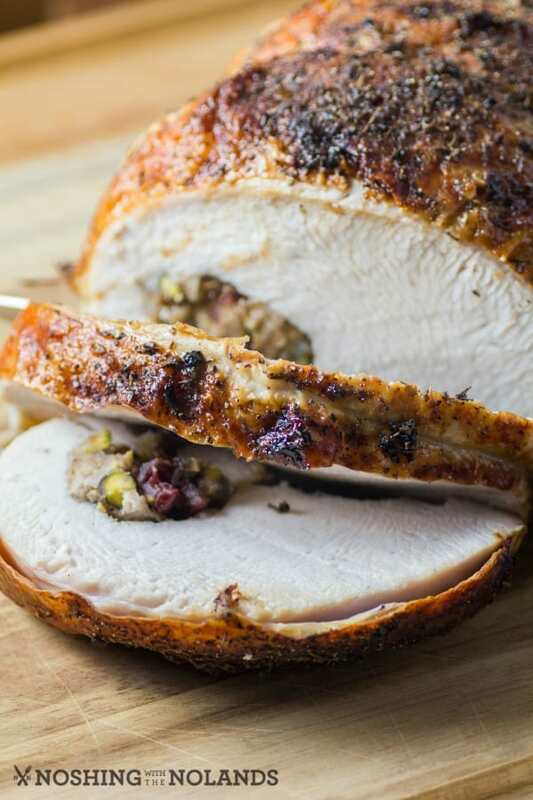 Stuffed Roasted Turkey Breast take so much less time and effort than roasting a whole bird and yet will still be the star of show! 1 large turkey breast, 3-4 lbs. For the brine place all ingredients except turkey in a large stock pot. Bring to boil and cook until salt dissolves. Remove from heat and allow to cool completely. Once cool, put the turkey in the brine and refrigerate overnight. When ready to roast. Remove the turkey from the brine and pat dry. Cook the onion in the Tbsp. of butter until translucent and then let cool. Break the bread into small pieces and place into a bowl with the cranberries, pistachios, poultry seasoning, salt, pepper and white wine or chicken broth. Add the cooked onion and mix well. Preheat the oven to 400F. Lay the turkey skin side down. In the smaller one third of the turkey breast lay in the stuffing and roll the larger side over. Slide twine under the breast and tie off in 3-4 places. Place the breast in a small roasting pan. Rub the outside with olive oil and massage with poultry seasoning to evenly coat. Roast for 1 hour and 30 min. or until thermometer reads 165F. Remove from oven and let rest for 10 min. Slice and serve with your favorite gravy. OK, so I totally followed this recipe from the link on Facebook. There is something so beautiful about food stuffed with food. It kind of makes me cry in a wonderful, wonderful way. Thank you Brett, I am so glad you liked it!! I have never made a stuffed turkey breast before. This looks so good! And it sounds like it may have a little kick to it. Yum! This looks delicious! I dont eat meat but i cook for a family that does. this recipe will be perfect for a fancier dinner! That turkey breast looks amazing. I am drooling all over my keyboard just looking at it. I want some of this now. 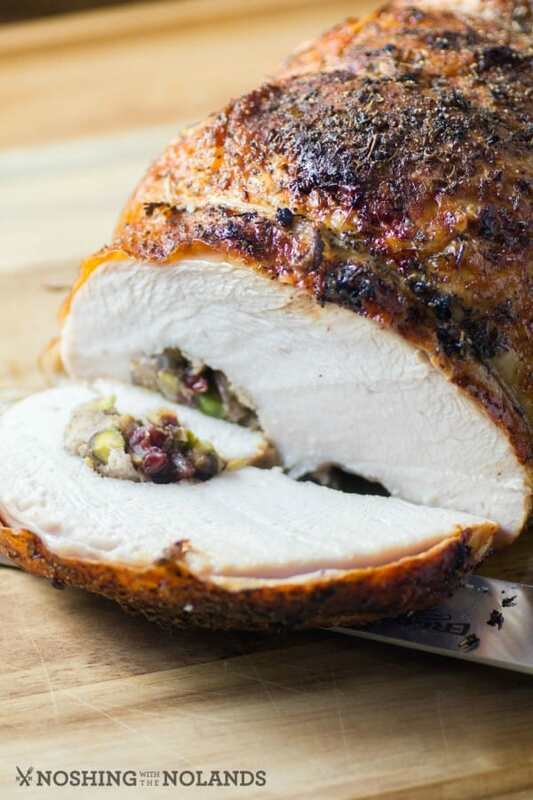 This stuffed turkey breast looks so delicious. I will have to try it for Thanks giving this year. I already have the turkey breast and I was looking for something different to do with it. this does look good, but I have never seen turkey breasts in our stores. Where did you get yours? I will have to bookmark this recipe for the Holidays. It looks so juicy and delicious. I can not wait to try it. I love making turkey dinners. 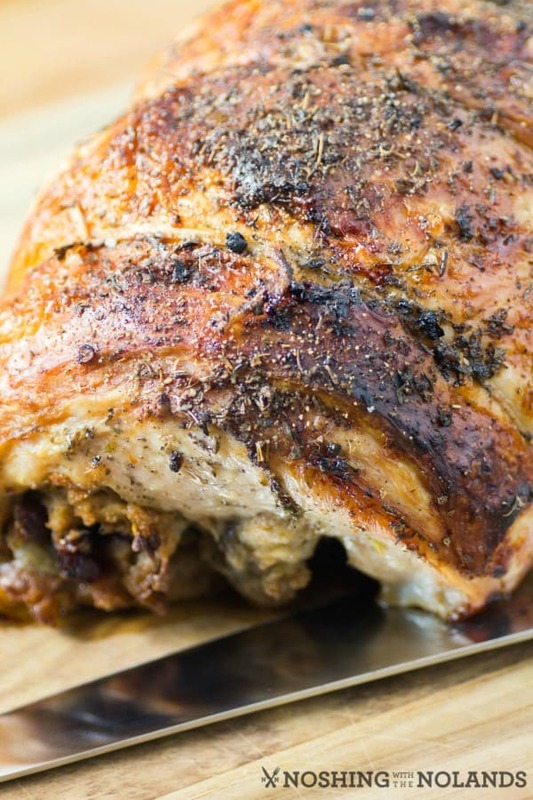 We all love the white meat so this is the perfect recipe for my family. This looks really good. Turkey is one of my favorites. I’m going to have to try it out soon. Yum! While I’m not a meat eater I will be passing this recipe on to my siblings who are always so stumped when it comes to preparing the turkey! I’ve cooked a zillion turkeys, but I’ve never cooked just a turkey breast. I’ve also never stuffed something and made it look pretty like this! I may need to up my game! OK, it’s like 11 at night and now I am totally craving your recipe. I need to remember not to read recipes when it’s time for bed. LOL! This looks amazing! It’s perfect for a fall dinner! This Stuff Roasted Turkey Breast looks so delicious. This would be perfect when I don’t feel like cooking a full turkey. I haven’t tried pistachios in my stuffing before. Wow! This looks so good! I am definitely going to make this. Do you put any liquid in the roasting pan with the turkey breast and does it need to be covered while its in the oven? No I don’t put any liquid in and I don’t cover it. It is cooked like a roast but stays moist from being brined. thank you for this, a nice “pre-game” Thanksgiving meal, great suggestion too on brining for this one! You don’t talk about how much fun it is to bone a turkey breast if you don’t have a butcher to do it for you. Don’t use boneless breast from the store because they are loaded with sodium and other stuff. One will have to unravel it anyway and you may have to cut it up too. I have made an almost identical recipe to this from Pinterest twice and boned the breast, getting better at it! You are lucky! The major companies (Butterball, Honeysuckle) sell the breast on the bone frozen. It has only been in the last few years we have been able to get fresh turkeys but I haven’t seen the breasts sold fresh (yet!) I will keep looking. I wondering if this can be put in a rotisserie to be cooked? I would be a afraid of losing some of the stuffing but if it is held well with the forks of the rotisserie I would give it a try. All else fails put it in the oven to finish!